The War and peace challenge proved, despite the thousands of obvious effects both war-time and peace have had on fashion, to be strangely difficult for me. I'm an expert at getting stuck in a train of thought inspiration-wise and this was no exception. That's why these challenges are good stuff; practice makes perfect, right? Also, this thing about producing something is great practise on my ongoing good-enough-stop-whining! project. Therefore, in the end, this challenge ended up with three separate lines of thought that don't necessarily merge in the end - or at the very least don't quite make historical accurate sense combined in one project - but here goes. 2. Second thought: War is normally very bad for trade. Trading routes are closed, goods are taken elsewere because of unsafe roads and/or political reasons and that means shortage of well... most things. Not least fabrics and luxury items. Blah, blah - I'm sure this is the one thing that's obvious to all of you. On the other hand, in some circumstances the display of wealth despite conflict could of course be a political tool, and act of defiance or a smoke-screen hiding a lack of resources; but that's of course not for everyone in society. So, based on those two thoughts I went for a set of black sleeves for the black gamurra. 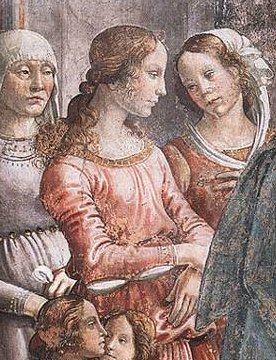 Didn't aim for replicating an exact set of sleeves nor total accuracy, but when browsing for inspiration I (as usual) found Ghirlandaio. Both pictures are from the frescoes of Tuornabuoni chapel in Santa Maria Novella, Florence, and painted some time between 1485-90. 3. War doesn't have to be large scale affairs with armies. Florence wasn't exactly all peace, rainbows and unicorns in the last quarter of the 15th century. People go on and on about the Borgias (yes, yes, the series have a lot of pretty dresses, I admit it!) but since long before that I've found the Medici family very interesting. Long story short, the Medicis held the power in Florence for most of the late 1400's but not unchallenged. The Pazzi conspiracy in 1478 being the most known one, before they were temporarilly kicked out by Savonarola in 1494. So apart from the constant mini-wars of Italy during the period, I imagine a kind of civil war of propaganda and displays of power within Florence. So, a set of sleeves it was. I decided to make them lined from the start, to avoid unnecessary work around the openings. 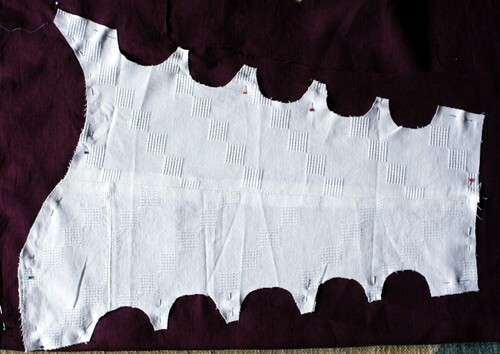 I started with my trusted Tudor Tailor pattern for the sleeves - the shoulder curve work, and that's the part I hate doing from scratch. 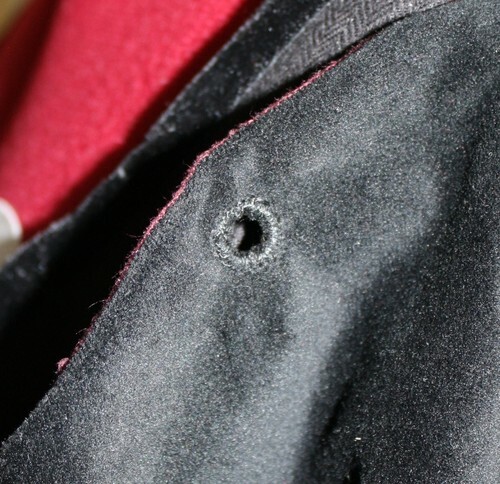 In order to aviod a seam on the front of the sleeve, I made it straight. At this point I also added the openings to the pattern. Without seam allowances in the "holes" since it's so very hard to estimate the size of the openings with seam allowances all around. Voilà! 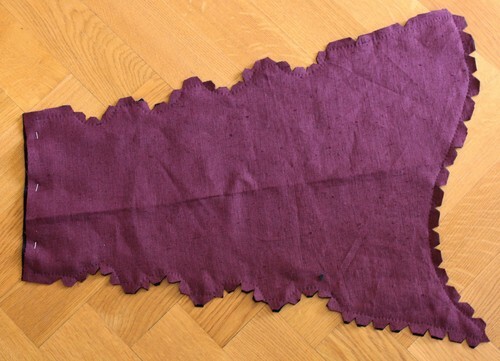 A one-piece sleeve pattern, pinned to the lining fabric on the fold. In the last fitting of the pattern, I realised that the top opening got a strange shape, so omitted it when cutting the actual sleeve. 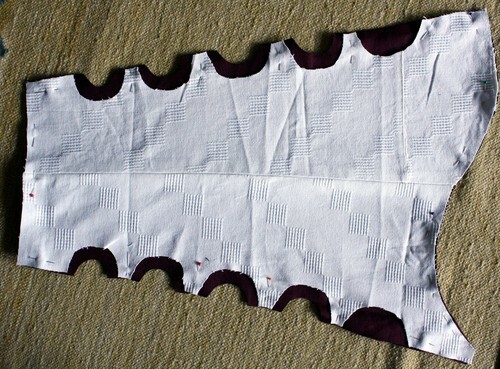 Also re-added seam allowance around the openings. 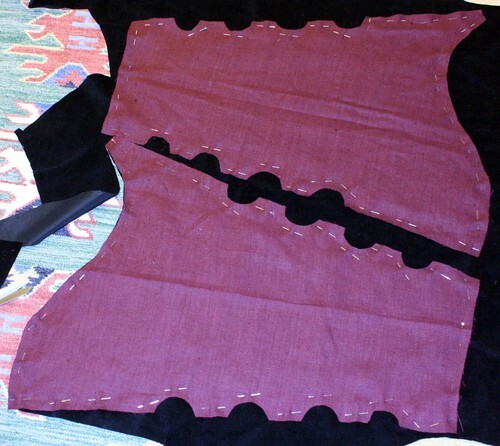 The two lining pieces were then pinned to the right side of the velvet. After I cut it I had to re-pin it like half a dozen times in order to get the velvet to lie flat. Have I mentioned that everytime I do these things I wow not to work in synthetic fabrics again? I then sew (running stitches) along all outer edges except the cuff and cut the seam allowances to avoid unnecessary bulk. 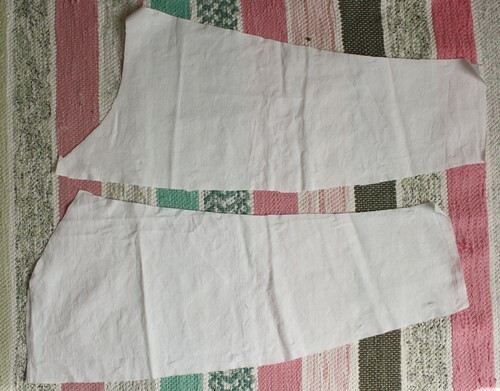 The sleeve was turned inside out and the back seam was done whipstitching the finished edged together, with fairly dense stitches. It seems to have worked and keeps the velvet from bad behaviour and bulkiness, since it really doesn't respond well (at all) to being pressed. I've learned since the partlet. I then added glass beads around the edges for much the same reason: keeping the layers together around the opening. 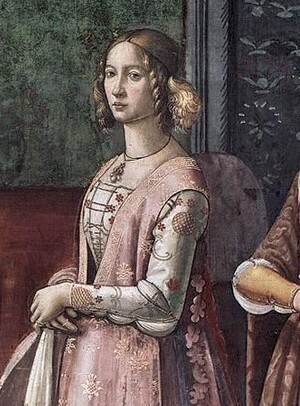 As can be seen on the pink dress above, there are at least examples of some kind of decoration along the edges (though of course embroidery might be more HA). 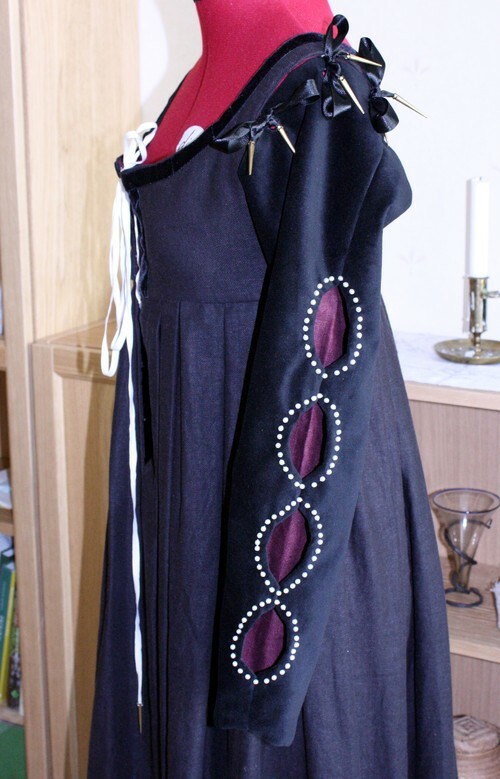 I finished the cuffs and added holes for lacing it to the existing ties on the gamurra. 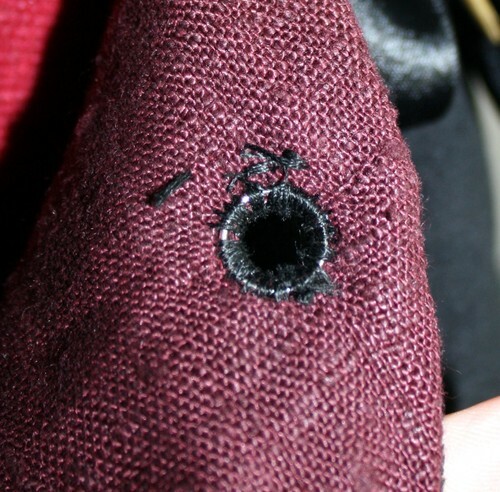 I was afraid it'd be hard to pierce the velvet, but on the contrary - it was almost too easy, so I added a metal ring on the inside of the hole to make the edges more resistant. Hopefully it works. At least the rings made for a very neat buttonhole stitch on the outside! How historically accurate is it? At a quick glance, it can pass. Material-wise: not really. 60% perhaps. Hours to complete: Didn't count, perhaps 12 including making the pattern. Hand-sewn. Total cost: Outer fabric about 9 euros, lining 5 euros, glass beads about 5 euros, total cost about 20 euros including the rings. All from stash, and apart from the beads ”scraps” from other projects.